Love new writing? Love East London? 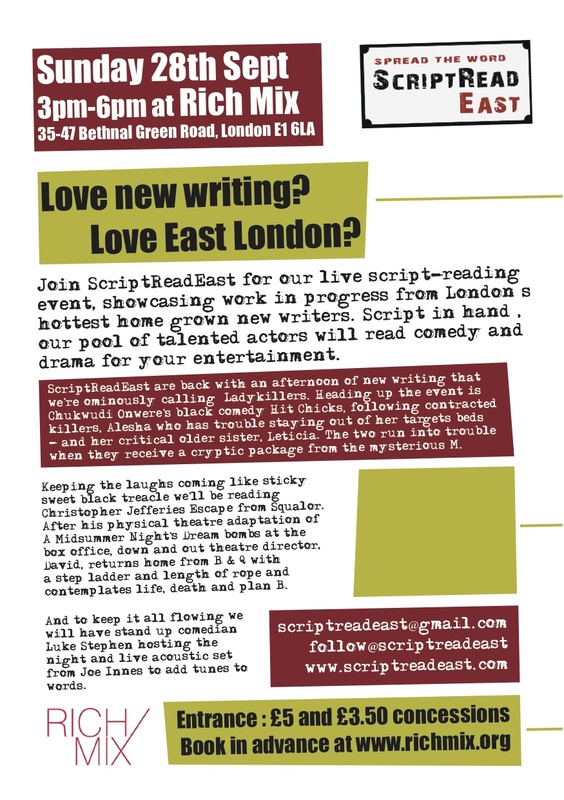 Join Script Read East for a unique evening of comedy, music and of course drama. We showcase work in progress from London’s hottest, home-grown new writers. Our panel carefully select the brightest two scripts from a round of submissions to be performed – script in hand – by our pool of talented local actors for your Sunday afternoon entertainment. Be involved in emerging talent – watch as scripts are brought to life, give your opinion on new work and network with some of the bright young things of the film and theatre world. This September, we’re back with an afternoon of new writing that we’re ominously calling ‘Ladykillers’. Heading up the event is Chukwudi Onwere’s black comedy Hit Chicks, following contracted killers, Alesha – who has trouble staying out of her targets’ beds – and her critical older sister, Leticia. The two run into trouble when they receive a cryptic package from the mysterious ‘M’. Keeping the laughs coming like sticky sweet black treacle – we’ll be reading Christopher Jefferies’ Escape from Squalor. After his physical theatre adaptation of A Midsummer Night’s Dream bombs at the box office, down and out theatre director, David, returns home from B & Q with a step ladder and length of rope and contemplates life, death and plan B. And to keep it all flowing we will have stand up comedian Luke Stephen and a live acoustic set from local Joe Innes to add tunes to words! Anna Lines is a scriptwriter from Ladbroke Grove who helped to start and run the very successful ‘Off The Grove’ scriptwriter’s showcase in the 1990’s – one of the first of its kind in the UK. With sparkling new writing attracting established actors like Lenny James, Frances Barber and Rhys Ifans, OTG drew a loyal following for new talent and soon established itself as one of the most important nights out on the TV and film industry calendar.